CFA Members: Special Event ! 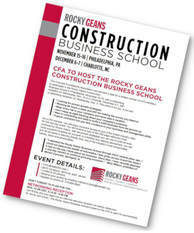 The Concrete Foundations Association has secured two dates for a limited number of CFA members to participate in the Rocky Geans Construction Business School. Looking for proven growth strategies. Working 80 hours a week and still not making the money you deserve. Wear every hat in your company and never take a vacation. Can't sleep at night thinking about your company's problems. New to contracting and want to build a solid business from the ground up. A good contractor but you lack confidence in your business and management skills. As a CFA member, you will enjoy exclusive access to one of the lowest industry rates for this two-day event. You will receive a copy of the 250-page reference book produced by Rocky Geans, with field-proven strategies you can use to build an even more successful business for yourself. ​In a friendly and relaxing atmosphere, you will join 30-40 peers in learning directly from one of the industry's most recognizable names, faces and personalities. MORE DETAILS: Download the Event Flyer! We accept only 25 participants per class so register as soon as possible. The fee per person for both days is $695. *If you would like to schedule an event in these locations while he is in the area, contact Rocky. Consulting services (including on-site and phone consultations) can be the ideal solution for some owners and organizations. Be sure to review the options with Rocky, from there he can closely target your specific needs.